Vanderbilt University Medical Center investigators have identified a cellular receptor for a toxin from Clostridium difficile (“C. diff”) — the leading cause of hospital-acquired diarrhea in the United States. The discovery, reported in the June 2 Proceedings of the National Academy of Sciences, lays the groundwork for therapeutics that block the toxin-receptor interaction to treat C. diff infection. C. diff infections are increasing in frequency and severity, said Michelle LaFrance, a graduate student working with D. Borden Lacy, Ph.D., associate professor of Pathology, Microbiology and Immunology and Biochemistry. The bacterium forms spores (dormant bacterial structures), which makes it particularly difficult to remove from hospitals and other health care facilities. It caused nearly half a million infections in the United States in 2011, and 29,000 people died within a month of the initial diagnosis, according to the Centers for Disease Control and Prevention. “It’s really important for us to start developing new treatment options,” LaFrance said. C. diff produces two large toxins — TcdA and TcdB — which enter epithelial cells in the colon and cause fluid secretion, inflammation and cell death. Little is known about the receptors that enable cellular entry and function of the toxins, Lacy said. To identify a cellular receptor for TcdB, Lacy’s team employed a “gene-trapping” technique pioneered at Vanderbilt by Donald Rubin, M.D., and H. Earl Ruley, Ph.D., both professors of Pathology, Microbiology and Immunology. Rubin developed a “library” of colon cells, in which each cell has a disruption in a distinct gene. If a cell has a disruption in the TcdB receptor — or another component of the signaling pathway required for toxicity — it should survive exposure to the toxin. LaFrance treated the library of cells with TcdB, selected surviving cells and identified the genes that disrupted toxicity. One of these was poliovirus receptor-like 3 (PVRL3), a member of a family of proteins that are receptors for polio, measles and herpes viruses. “A key to our study was starting with the most physiologically relevant cell line – human colon cells,” Lacy said. The investigators used two additional genetic tools to demonstrate that disruption of PVRL3 makes cells resistant to C. diff toxin B. They found that adding PVRL3 back to these cells restored toxin-mediated cell death. They also showed that PVRL3 protein and toxin B bind to each other in vitro, and that pre-treating susceptible cells with antibodies to the receptor or adding soluble receptor both blocked toxicity. “These studies are a proof-of-concept that by blocking this interaction, you can block activity of the toxin — which suggests new strategies to either augment or replace the need for antibiotic therapies in the treatment of C. diff infection,” Lacy said. 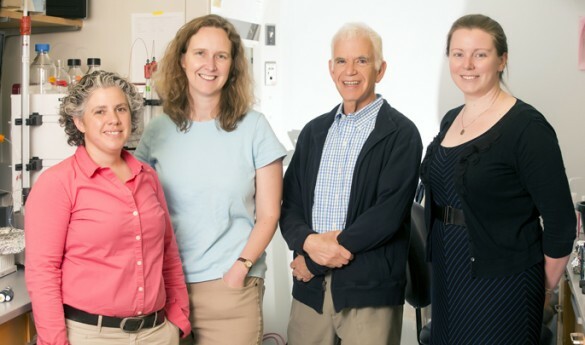 In studies of human colon tissue samples from a patient with a C. diff infection, Melissa Farrow, Ph.D., a postdoctoral fellow in Lacy’s lab, found that PVRL3 and TcdB co-localized to the same cellular sites. “These data support the physiological relevance of PVRL3 as a receptor for toxin B – this interaction is happening in the affected tissue in patients,” Lacy said. In ongoing studies, the investigators are determining the structure of the PVRL3-toxin B complex and developing ways to block the interaction. They are also planning a project using BioVU — Vanderbilt’s database of de-identified DNA samples with linked medical records — to study whether variations in the PVRL3 gene affect susceptibility to C. diff infection. “We’re excited about the implications of our finding – that PVRL3 may be a new therapeutic target, that we may learn about susceptibility and that they open a new avenue to study how C. diff causes disease: how the toxin gets into the cell and what downstream signaling pathways it triggers,” Lacy said. Other Vanderbilt authors of the study include Ramyavardhanee Chandrasekaran and Jinsong Sheng, Ph.D. The research was supported by the National Institutes of Health (grant AI095755), the Burroughs Wellcome Foundation and the Red and Bobby Buisson Foundation.